Tel Aruhn itself was a relatively small community, with a variety of interesting services in the wizard tower, and more commonplace supply stores in the houses surrounding it (for those who could not levitate). There was a good pub in the town. 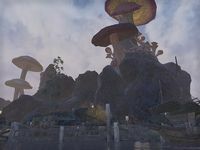 In the late Third Era there were regular boats passing to other destinations in the Azura's Coast region, with maritime links through to Vivec, Ebonheart and points west, or to Dagon Fel to the far north. 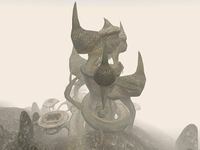 Although the city survived the eruption of Red Mountain, it was sacked by Argonians inflicting their revenge after centuries of slavery. This page was last modified on 11 September 2018, at 22:00.